What Does The S&P Downgrade Mean For Us? No one truly knows what the full impact of the downgrade will mean; we are in unprecedented territory. The stock market is plummeting as I write this. For sure, it will mean an increase in interest rates on debt issued by the US, which in turn, means an increase in interest rates for the rest of us. What Is S & P? Standard and Poor's (S & P) is a rating agency that rates securities (stocks and bonds) based on the management of the underlying entity that issues the securities. For instance, when they issue a rate on a stock, they look at the company in terms of earnings potential, how it stacks up in it's industry, and the track record of its management team, just to name a few criteria. AAA is the highest rating S & P gives; when a security, such as US Treasuries, which are long-term bonds issued by the US Government, are downgraded, S & P will state the reasons. Why Did S&P Downgrade Our Debt? As stated above, a rating is based in part on how well the entity is managed. S&P stated they lost faith in the US Government's ability to manage it's finances due to the rift between the political parties. Yes, there should have been some debate regarding how to fix our problem; the worrisome issue is that it took too long to resolve and there was too much bickering. 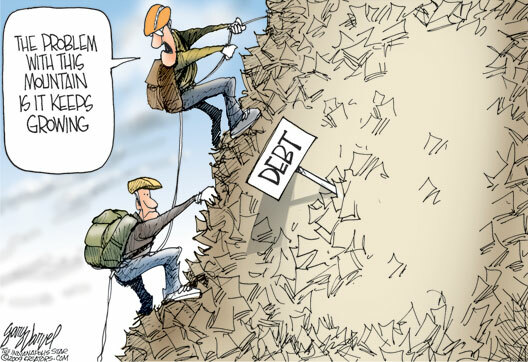 How Can The Debt Problem Be Fixed? Besides less political posturing, the US needs to cut spending and increase revenue. I used to think that by simply cutting spending, the deficit would be taken care of; however, from the many pundits I read, I have now concluded that the math won't work that way; we need revenue as well. Does That Mean More Taxes? Unfortunately it does. However, if we can create more jobs, that would bring in more revenue by the fact that there will be more people working and paying taxes. The best way to do that is to encourage businesses to spend more on investment, which means building factories and hiring more employees to produce more goods. But until the business owners are confident about the long-term, they probably won't spend the nearly $1 trillion they currently have socked away in the bank in the form of cash. What is your strategy during this unprecedented time?